Preheat oven to 350° F. Spray two 6-inch round pans with non-stick baking spray. Combine cake mix, milk, melted butter, sour cream, eggs and vanilla extract in a large mixing bowl. Using an electric mixer, beat on low for 30 seconds, then on medium for 2 minutes. Equally divide batter among the two cake pans. Bake cakes for 26-30 minutes, until a toothpick inserted in the center comes out clean. 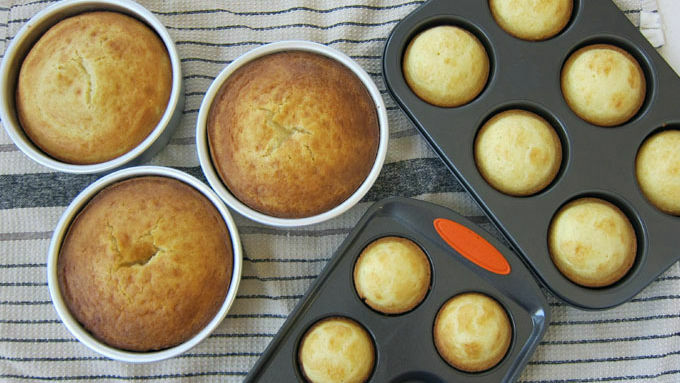 Remove cakes and allow to cool in pan for 10 minutes. Flip out onto a cooling rack and allow to cool completely. Repeat the process above to make the second cake mix. 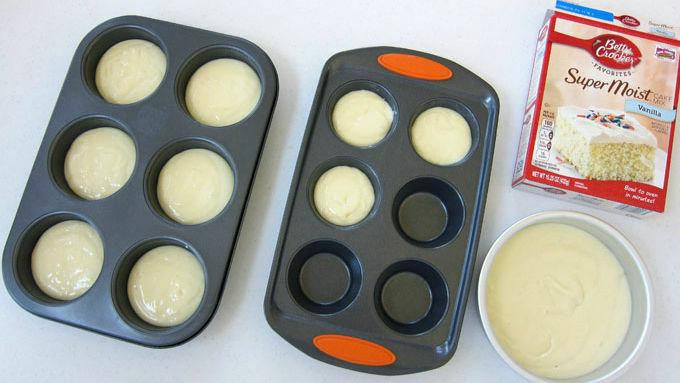 Spray one 6-inch round cake pan, 6 cavities in a jumbo cupcake pan, and 3 cavities in a standard size cupcake pan with non-stick baking spray. Pour 1/3 cup batter into each of the 6 jumbo cupcake cavities and 3 tablespoons of batter into each of the standard cupcake cavities. Pour the remaining batter into the 6-inch round pan. Place all in oven. Bake small cupcakes for 16-18 minutes. Bake jumbo cupcakes for 18-20 minutes. Bake 6-inch round cake for 26-30 minutes. Allow all to cool for 10 minutes, then remove from pan, set on cooling rack and cool completely. 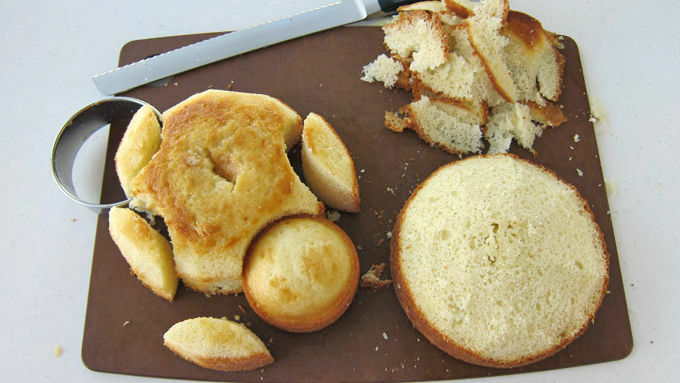 Cut 4 half-circles out of one of the 6-inch rounds, creating notches large enough for 1 jumbo cupcake to be inserted. 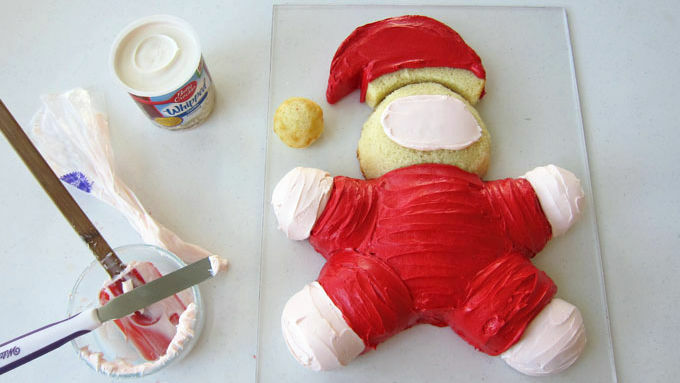 Set the cut cake on the lower third of the cake board, creating Santa’s body. Set 1 jumbo cupcake into each notch, creating the tops of the legs and arms. 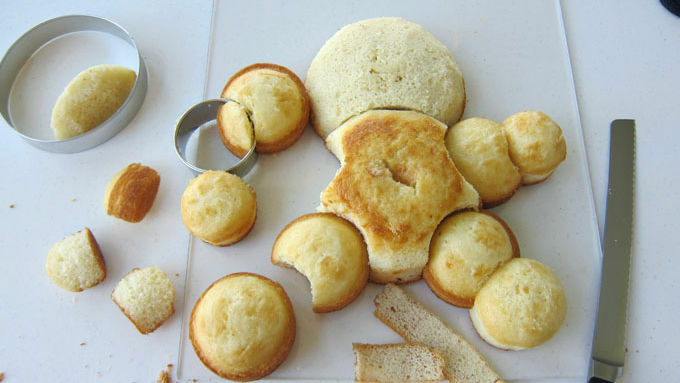 Cut a notch out of the 2 cupcake legs, large enough for another jumbo cupcake to be inserted. Set 1 jumbo cupcake within each notch. 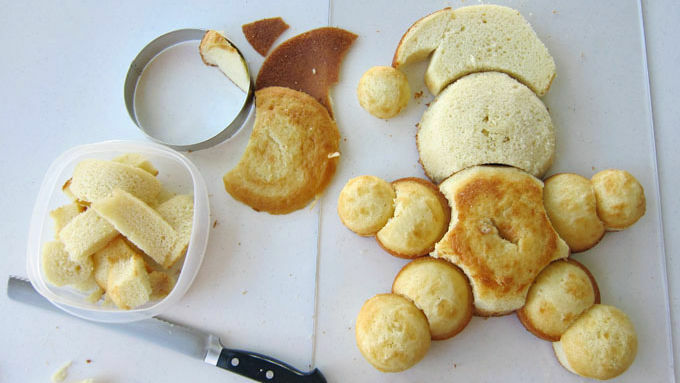 Cut a notch out of the 2 cupcake arms, large enough for a small cupcake to be inserted. Set 1 small cupcake within each notch. Cut a notch out of 1 6-inch round cake large enough for another 6-inch cake to be inserted. Carve the cake so it is more dome-shaped, cutting off the sharp edges on top. This will be Santa’s head and will attach to the body. Cut the remaining 6-inch cake into Santa’s hat, leveling and carving as needed. Cut the remaining small cupcake into a smaller ball for the tip of Santa’s hat. Attach 2 large candy-coated chocolates for the eyes and 3 for the buttons on Santa’s suit. Spoon white frosting into a pastry bag fitted with a jumbo star tip. Pipe white frosting fur around the hat, fur ball, beard and mustache. Add one red nose. Here comes Santa Claus! He's roly poly and adorably sweet and will make a whimsical addition to your Christmas party or dinner. 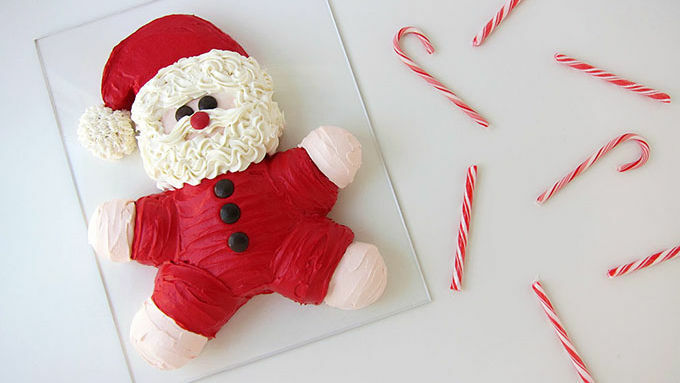 This cute cake was inspired by Sugar and Charm's Roly-Poly Santa Cookies. 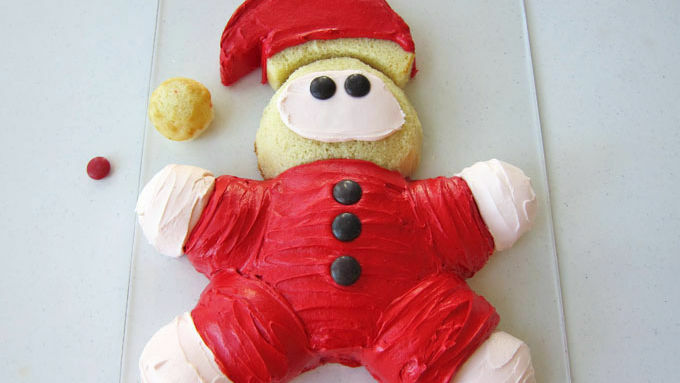 Similar to the cookies, this Santa is pieced together with several different sizes of cupcakes and cakes. It's carved, assembled, then frosted so it looks just like you used a shaped cake pan. You can use the baking and assembling instructions as a guide to make your own version of the jolly old elf. 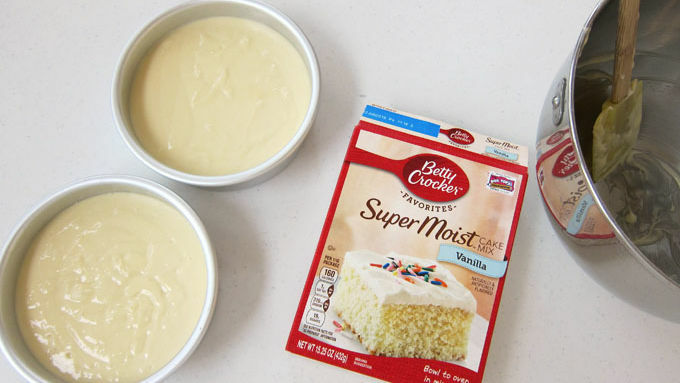 If you don't have the exact pans listed, just bake two 9x13-inch cakes and cut out the needed shapes. Once the cakes are frosted, no one will see the individual pieces anyway (it’ll just look festive and fun). 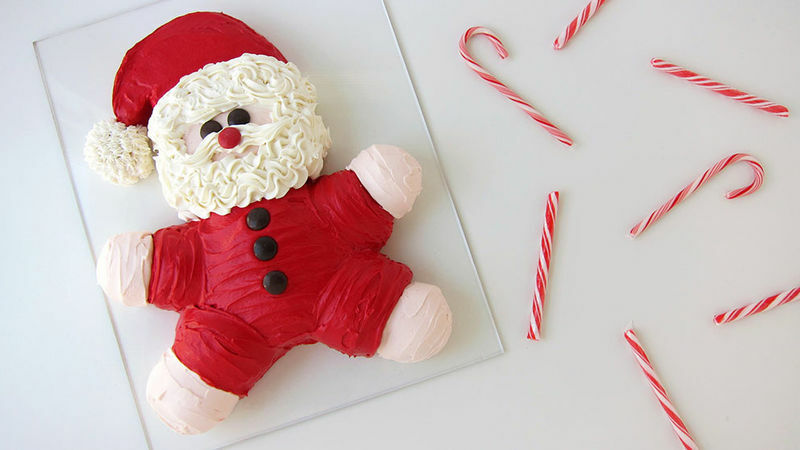 This cute, red-nosed Santa cake is ready to be set on your dessert table!